Our new app will allow us to send you useful and important messages throughout the week regarding our parish life and events, and allow you to reply to messages or RSVP for events. There will be no need for parishioners with smart phones to remember to silence their phones before Mass. The app will send you a reminder to silence your phone 20 minutes before the Mass you select. 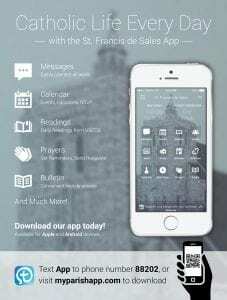 Many more great features will be a help to all of us, such as, daily Mass readings, Catholic news, prayers and prayer reminders, quick access to online tithing, Confession reminders, and our weekly bulletin.